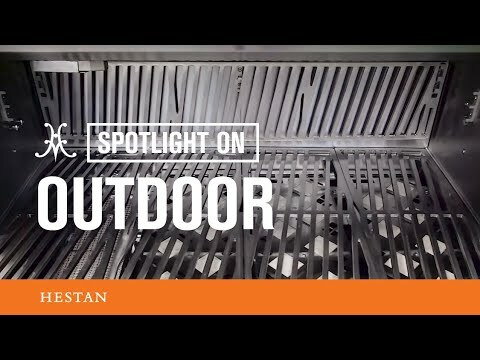 Hestan Outdoor grills combine the ultimate in precision performance & innovative design to meet the needs of every griller, from the novice to the experienced grill master. 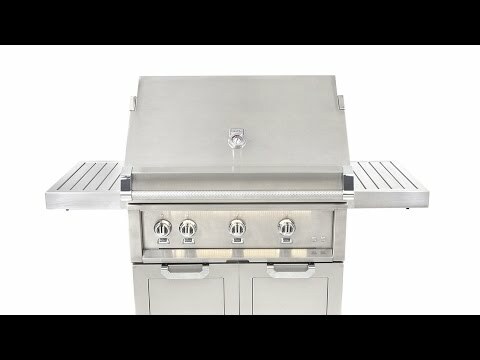 The Hestan Outdoor grill series is made in the USA with heavy-gauge welded-body construction, commercial grade end caps, Zamak die cast knobs, burner indicators & bezels and accented throughout by Hestan Marquise panels and handles. The Hestan 42-Inch Freestanding Natural Gas Grill On Deluxe Cart features four high-performance variable ceramic infrared sear burners that provide up to 25,000 BTUs each for a total of 100,000 BTUs of high performance cooking power. The ceramic infrared sear burner allows you to sear thick cuts of meat, sealing in precious juices. Grilling surface temperatures are evenly distributed by a radiant ceramic briquette tray system. The 18,000 BTU multipurpose ceramic infrared top burner with salamander placement makes is perfect for rotisserie, broiling or finishing and includes a concealed whisper-quiet chain-driven rotisserie motor system rated for up to 50-pounds, as well as a porcelain broiling pan, rotisserie spit and forks. The laser DiamondCut 5/16-inch stainless steel cooking grates and warming rack provide 782 sq. in. primary and 282 sq. in. secondary cooking area for a total of 1064 square inches of evenly-heated grilling surface. The warming rack features three vertical positions, allowing it to be used as additional cooking area or concealed storage when not in use. This grill comes packed with many convenient features that add to your grilling experience, including the easy-open, spring-assist Horizon hood, designed to stay open at any desired height. Motion-activated Stadium halogen under-hood lighting illuminates the grilling area while the LED control panel lighting keeps your controls visible for nighttime grilling and entertaining. The symmetrical flip-to-clean radiant tray and stainless steel removable drip tray make cleanup simple, and a one-push automatic ignition system makes lighting your grill a breeze. This Hestan Deluxe grill cart offers plenty of worktop space and convenient storage features, including a fold-down left side-shelf and a fixed right side-shelf with pullout drawer for easy access to BBQ tools and accessories. The Marquise style accent panels, side cart handle and commercial end caps compliment the beauty of the front control panel. A flip-down front panel gives you quick access to fuel tank valves, as well as a pullout tool storage drawer. An access door in the rear of the grill cart allows for concealed liquid propane tank storage, while a sliding pullout tray makes loading and unloading tanks quick and easy. Extra-large front wheels and commercial grade casters offer smooth cart movement with 360 degrees of maneuverability. This grill features durable, powder coated stainless steel panels in the Hestan signature Tin Roof color finish.